Incense cones are made out of a mixture of ground charcoal and potato starch as a binding agent. The aroma comes from a specially mixed fragrance additive. Incense cone production, which took place in cottage industries until the start of the 20th century, has been based in Crottendorf in the Erzgebirge since the mid-18th century. 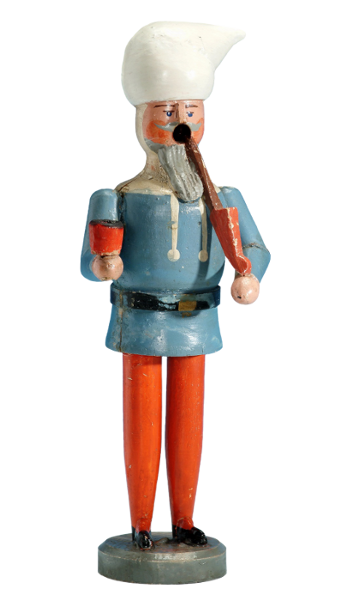 An incense smoker, on the other hand, does not crops up until meantioned for the first time in sample books and price lists from Erzgebirge toy and publishing businesses around 1850. Besides the enjoyment of the spicy fragrance, the reason for the sudden appearance of incense smokers was mainly the popularisation of smoking in the 19th century. Although 17th century paintings prove that tobacco was already not just consumed as snuff tobacco but also as pipe tobacco, smoking was not one of the usual everyday pleasures for a long time and was only practised in private. Smoking has only been tolerated in public since the 19th century. A man with a tobacco pipe in his mouth became a common phenomenon on the streets and quickly became a popular motif in figurative representations. The incense smoker also quickly became very popular as a result. The “birthplace of the incense smoker” is in the Erzgebirge, while later centres of incense smoker production can be found in the Erzgebirge and in Thuringia. The first creators of the incense smokers turned on a lathe who are known by name include Ferdinand Frohs from Heidelberg near Seiffen in the Erzgebirge and his nephew Gotthelf Friedrich Haustein. Haustein went independent and founded his own manufacturing tradition in 1858. In the process Louis Haustein and his wife Hulda (1857-1929), who were known under the name the “incense smoker Hausteins”, became extremely important and characterised a unique type of incense smoker. For the design of the arms, hands, ears and feet they used a kind of dough which was applied and shaped by hand. The same material was painted into a negative shape for the face and pressed onto the head turned on a lathe. 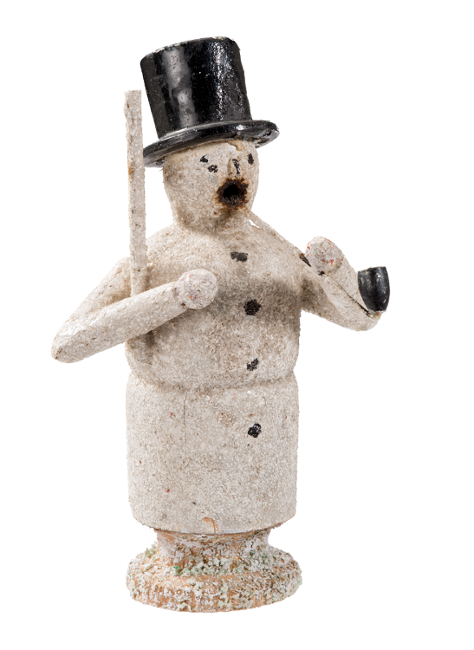 The Füchtner family from Seiffen, who were particularly famous for their nutcrackers, founded another workshop tradition for incense smokers. Incense smokers consist of two separate parts that are placed on top of each other. They are made predominantly out of hard wood without using any heartwood which could crack as the heat builds up. The upper body’s raw form with head is turned on a lathe out of square timber, the figure’s stomach is hollowed out afterwards. The incense cone that is placed on the bottom part of the incense burner will later glow inside the hollowed out stomach of the incense smoker. A “channel” leads from the hollow stomach right up to a round mouth opening where incense “smoke” comes out. Afterwards the legs, arms and base are turned on a lathe, the headgear, nose, shoes, attached pipe etc. are made separately. After they are put together they are polished and primed and finally everything is colourfully painted. While the incense smokers were carved very individually in the western Erzgebirge and reached the market as unique pieces, in the eastern region very early on they were being produced in their stylised simplified form turned on a lathe. These incense smokers were therefore suitable for larger production in factories. 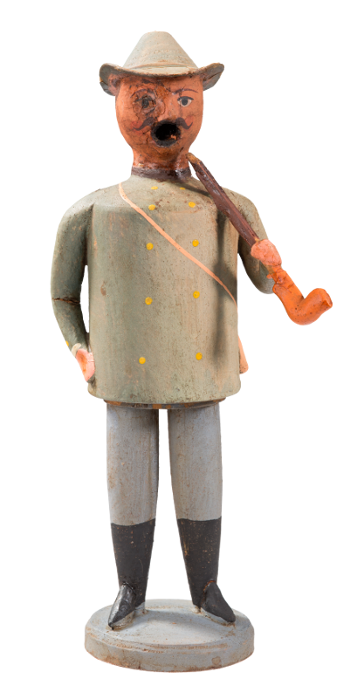 The models for the first incense smokers were people from everyday life, such as miners, forest workers, bird sellers, postmen etc. “Rastelbinder” were also some of the more popular representations. This resulted from the fact that in the 18th and 19th century it was mainly many Slovaks who trekked through the European countries as wandering craftsmen, merchants or tinkers and were part of the familiar street scene. The fact that the spirited Turk in his colourful garments became a popular motif for the otherwise rather folkloric incense smokers was probably due to the association with Turkish coffee, honey and tobacco, whose consumption was particularly “á la mode” in bourgeois families in the 19th century.